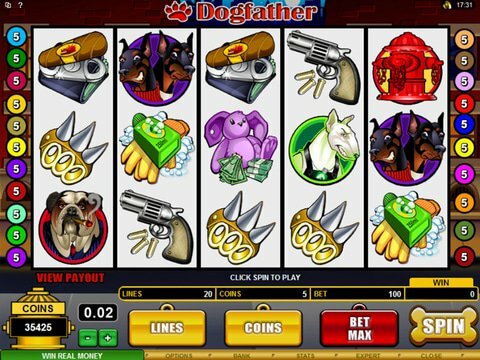 Dogfather online slots is a play on words, as it is a Godfather underworld theme, but with dogs as the main characters. There are 5 reels and 20 paylines in the game and on a single spin you can win a maximum real jackpot of $32,500. You do not have to be a top dog to play the game, as the betting range is from only 1 cent all the way up to $50. You can also enjoy it here without downloading anything. There are many features in the game like a wild symbol, scatter symbol, multiplier, bonus game, and free spins. Just a few of the symbols in Dogfather include a few dogs, a flea, a fire hydrant, a gun, brass knuckles, and a cigar and cigar cutter. The Bulldog dogfather is the wild and by spinning on 3 or more of the itchy flea symbols you will win 13 free spins where any win will automatically be tripled. Spinning n 3 or more of the fire hydrant symbols will trigger the bonus game and you are presented with a few hydrants and you choose the one you want each having a different payout. The graphics in Dogfather online slots from Microgaming, are fantastic with all the canines and their underworld tools of the trade and the sounds will make you think of the Godfather classic film. To win the max jackpot you have to click the Max Bet button, which is located along with your current game balance at the bottom of the screen. A couple of other cool features in the game are the demo mode where you can play the game for free and the expert mode where you can use the autospin feature. Canadian players are urged to check out the no deposit bonus at Jackpot City. They also offer 100% up to $500 as a welcome bonus. Use this slot machine to clear your wagering requirements today!